When creating an indoor grow tent for growing marijuana, one of the most important decisions is what kind of lights to use. 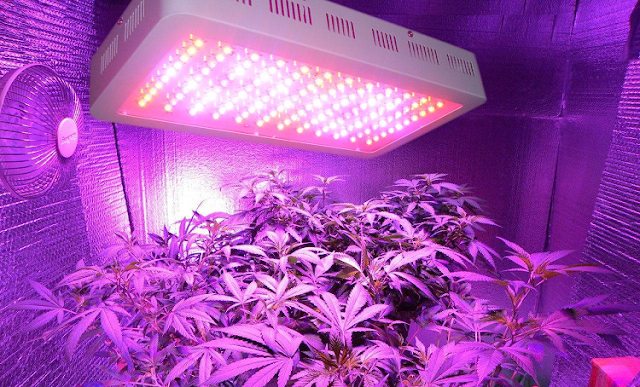 LED grow lights have not always been popular with marijuana growers. However, technology has improved, and so have LED lighting systems. Although they would not have been a reasonable choice for marijuana growers five or ten years ago, they are becoming more popular every day. We can now find LED lights not only in the indoor marijuana grow tent, but also in cars, offices, and homes. I suggest you should know the the advantages and disadvantages of using LED lights before you choose it. About the advantages of LED linghts. First and foremost, the energy savings are enormous. If you compare using an LED light for the same purposes as you would an HID light, using the LED light will save you about 40% of the energy consumption. They also last a lot longer. You can expect between 50,000 and 60,000 hours of working use of an LED light, compared to between 2,000 and 3,000 hours with an HID light. This is because LED lights don't have a filament to burn. LED lights turn instantly on and off, unlike HID lamps, which need to warm up before being fully lit. LED lights can even be dimmed quite easily. Classified as "Class 1 LED product," LEDs are considered a safer lighting option. This is because they don't have mercury like some other lights, such as compact fluorescent bulbs (CFLs). LED lights focus using the lenses, which means there is less of a need for reflectors like HID lights, which disperse the light without focusing and, therefore, need an external means of focusing. HID lights need approximately 100 to 150 Watts of more power than LED lights since there is power management built into the LED lights. HID lamps require external ballasts and, therefore, add extra watts of consumption. LED lights take up less space, emit light faster, and are more durable and shock-resistant than HID lights. They also have a much lower heat output, therefore lowering the need to keep your grow room cool. This reduces the risk of fire significantly. HID lights will become very hot, but good LED lights feel cool when you touch them, even after running for several hours. The efficiency of LEDs is particularly noticeable when compared to CFLs. You can expect to save about 50% of your energy bill when you choose an LED over a CFL. When using LED lights, precise power (current) management is necessary. Additionally, LED lights have higher upfront costs. That being said, they are less expensive over longer periods of time. LED lights particularly need more specific current and heat management than do HID lights, when they are powerful lights to be used to light entire large areas. OK, Now that you know its advantages and disadvantages, will you choose it?